Fortune commissioned a cover from comic-book artist Chris Ware. He used the opportunity to question some of the foibles of modern capitalism, depicting a "Stocks and Bonds Casino" among other satirical places. So the magazine apparently shelved his work. 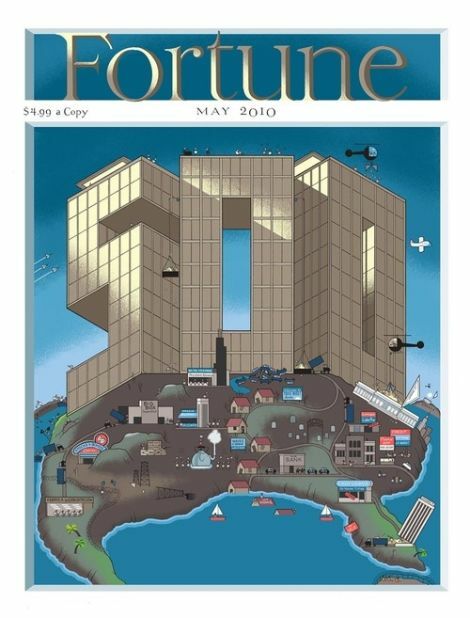 ...showed a cover he did for Fortune magazine which was supposed to be on the Fortune 500 issue. He accepted the job because it would be like doing the 1929 issue of the magazine, and he filled the image with tons of satirical imagery, like the U.S. Treasuring being raided by Wall Street, China dumping money into the ocean, homes being flooded, homes being foreclosed, and CEOs dancing a jig while society devolves into chaos. The cover... needless to say, was rejected. Fortune and Ware did not immediately return calls for comment. As we often do, Fortune commissioned multiple artists to submit cover concepts for our iconic Fortune 500 issue. Being huge fans of Chris Ware's work, we asked him to participate, but in the end we chose a design submitted illustrator Daniel Pelavin.